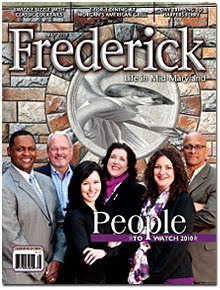 Frederick Foodie: Welcome Frederick Magazine Readers! A big woo hoo & thank you to all the new readers who found Frederick Foodie through the new issue (May) of Frederick Magazine! I'm delighted to have you check out my blog! And for all of you folks that are regulars, well, thank you to you too! I've been lucky enough to have been in the magazine a time or two, but this is a really big deal to me, and is very, very exciting. The cover! I even ran down to The Muse on Market St on Saturday and snagged the owner's copy to take to my mom & dad. They should be out on newsstands today, so I'll be able to buy the obligatory 10 or 20 copies :). If you haven't been there yet, please check out the web site for The Kitchen Studio at http://www.kitchenstudiofrederick.com/. We would love to have you come take a cooking class or try our one of our Make It, Take It, Bake It meal assembly sessions. Though we really put a lot of our attention to teen, tween, & kid cooking camps over the summer, we still have a light adult summer class schedule rolling. Don't see anything that's working for you? We have a few more classes being added to the schedule this week, but feel free to drop me an email or leave me a comment and we'll do our best to accommodate you this fall. If you're checking us out for the first time, you may want to try one of our fabulous Bring-a-Friend-for-Free classes. This month, Kitchen Studio sous chef and new instructor Kerry Lebherz will be whipping up a wonderful Mediterranean Dinner for your enjoyment on May 25 from 6:30-9. It's a great way to see what we're about and enjoy a night out with a friend, especially if you're watching your bottom line. No matter what, I'm thrilled that you're here and really appreciate you taking the time to check us out. Cheers! Congratulations on the great publicity--you deserve it!! !